The Improbable End of Owly is an interactive multimedia art installation for festivals and events. A 1960's caravan has been transformed into an 18th century stage coach and when stepping inside the user takes part in a choose your own adventure game. The game is based on our beloved Owly, a half-man half-owl aristocrat who fulfills all the stereotypes of the cruel, old fashioned, landed gentry. The player steers Owly through his last day on earth and the choices made by the player will decide Owly's fate. This quirky, fun and fully immersive audio visual experience, with lighting and smoke effects is suitable for all ages. The experience lasts for 10-15 minutes and serves 3-4 players at a time. 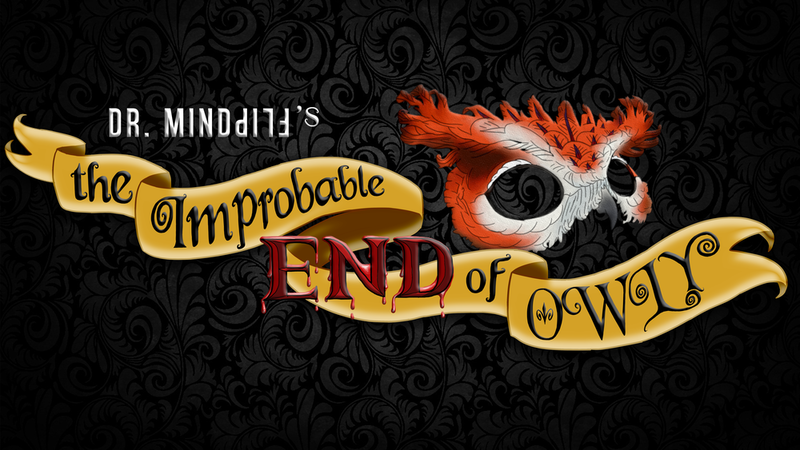 The Improbable End of Owly is accompanied by an original and varied soundtrack; instrumental harpsichord versions of Dr. Mindflip songs were recorded especially for the project, along with atmospheric motifs from Rainwater Studio and an exclusive Dollhead techno track. The player enters the lush interior of the stagecoach adorned with images of the dearly departed Owly. The player is seated in front of two large buttons, one green and one red which are used to interact with the game. On a screen in front of them an interactive movie plays Owly's last day on earth and at the end of each scene the player makes a decision that will determine the fate of Owly. Our team wrote a fully original script and prepared a story board to suit an interactive movie experience whereby the player is in control of how the story-line proceeds. After each scene the player is given a choice of how to proceed by pressing either the red or green button on the controller. We undertook a full scale film production including, directing, lighting, audio, costume, set design and editing. The footage was shot on location at Ballincard House, a manor house in Co. Offaly. The interior and exterior design strives to create a space for the player which replicates the atmosphere of the game and reflects the personality of the main character, Owly. The interior is grandiose and plush, to the gratification of Owly's self indulgence. Audio visual equipment was incorporated in the interior design including TV, speakers, controller, smoke machine and lighting effects. The audiovisual element of the game operates via an interplay between an external micro controller and audiovisual cueing software. The micro controller (Arduino Leonardo) is connected to the red and green buttons and is seen by the computer as a keyboard. It sends different keystrokes depending on which button is hit and when. The cueing software (Show Cue Systems) then plays a different video depending on what keystroke it receives. This software also controls the smoke machine and lights in the caravan allowing them to change colour and intensity in sync with the video. This approach makes the game a fully automated experience which needs no input from our team during play. A member of our team will however be present at all times.